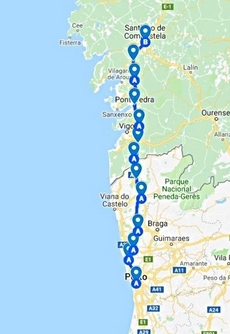 This was the route chosen by most of the Pilgrims going to Santiago, from the beginning of the 14th century. 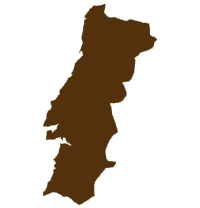 The most distinguished Pilgrims who walked it : Santa Isabel, Queen of Portugal,King Manuel and probably also St. Francis of Assissi. After the completion of the Barcelos Bridge in 1325 and the renovation of the one at Ponte de Lima , it was possible to follow a straight route without having to cross dangerous rivers. This portuguese road was also the one commonly used by the population which moved from South to North of Portugal encouraged by its safety and comfort. Along here went multitudes of the anonymous, vagrants, travellers, mule-drivers, peddlers, market-goers and local pilgrims. It was also used by the regular army, the Ordonance Company and common soldiers, by gangs of adventurers, bandits and smugglers. Roman via and bridges, green coutnryside, river crssings through the renowned vineyards of the Douro region, as well as many religious sight seeings and monuments adorn this route less frequented, more peaceful than the Camino Frances. Carefully selected 2 and 3 star hotels and Quintas with private bathrooms. All lunches and dinner. Visits.